"Coraline discovered the door a little while after they moved into the house. . . ." When Coraline steps through a door to find another house strangely similar to her own (only better), things seem marvelous. But there's another mother there, and another father, and they want her to stay and be their little girl. They want to change her and never let her go. Coraline will have to fight with all her wit and courage if she is to save herself and return to her ordinary life. Celebrating ten years of Neil Gaiman's first modern classic for young readers, this edition is enriched with a brand-new foreword from the author, a reader's guide, and more. Coraline is one of my favorite movies but not my favorite book. The book feels, sadly, lazy compared to the movie. It is very dull, Coraline doesn´t have a personality. The plot has so much potential, and it is the only thing that kept me reading. I can´t even remember what the climax was. I read this book because as I said, I am a big fan of the movie. However, I would still reread it, I don´t even know why. As I said the story is amazing and you can always read it if you are a fan of the movie. Coraline was a well written story that simply was not to my taste. I like a good thriller, but this book was strictly horror, which is usually not for me. Coraline finds a secret door in her house that leads to another world similar to her own, complete with her parents, but are they really her parents? There are differences between her "other mother" and her own that Coraline can't ignore including the buttons that seem to take the place of her eyes. 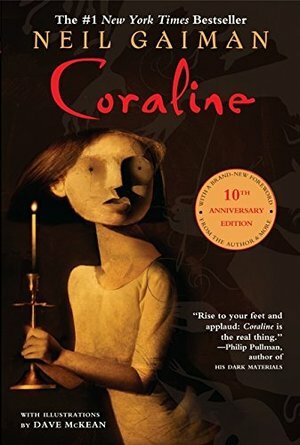 Coraline finds that her "other mother" may not have her best interests at heart and her motives may be to hurt rather than help. Other characters in the story play minor roles including Coraline's "other father," an odd man who lives upstairs, a pair of strange old ladies, and a cat that is more than what he appears. This book would be wonderful for those who like scary stories, but it was just too creepy for my taste.